Ring barking or girdling can cause dieback or death of a tree. Damage may result from careless use of machinery close to a tree, excessively tight wire or tree ties or mammals gnawing on the bark, often at the base of the main trunk. Occasionally, girdled trunks or limbs can be saved. What is ring-barking or girdling? Ring-barking or girdling are terms used to describe the complete or nearly complete loss of bark from around the circumference of a tree or shrub’s limb or trunk. This disrupts the movement of water and nutrients between the roots and the top growth (sap flow). If untreated it can result in dieback or death of the affected plant. Careless use of a strimmer or mower around the base of trees. Gnawing of bark by mammals including voles, rabbits, deer and horses around the base of newly planted trees or in very cold weather when food is scarce. Access to bark above tree guards can occur when snowfall is deep. Stripping of bark by grey squirrels, though this is often higher up in the canopy of more mature trees so does not usually result in the tree’s demise. Deliberate ring-barking: Ring-barking is sometimes used as a technique for killing off unwanted vegetation. However, it is not a recommended practise in most horticultural circumstances as this may provide a source for honey fungus infection and is unsightly. Partial ring-barking or ‘ringing’ is also used in fruit production to reduce shoot vigour and promote fruitfulness but again is not advised for home gardeners as it can, if not done properly, lead to the loss of the tree. Bark is removed partially or completely at or above ground level exposing the paler inner wood. This can be accompanied by withering, dieback and death of the tree though recently damaged trees and those in a dormant state may not show symptoms initially. The feeding pattern of mammals on trees is often distinctive; depending on their size and teeth pattern. For more detailed information see the Forestry Commission leaflet on Recognising types of mammal damage to trees and woodland. In cases where the bark has been damaged but some or all of the cambium and phloem remains, the tree may make a natural recovery. If in doubt, however, attempt repair. Repair the damage whist still fresh for the best results. Retain as much of the remaining bark as possible to help the movement of sap and encourage healing. Step 1: Pare the rough edges away with a sharp knife. Step 2: Cover the area with a 4cm deep layer of damp moss. Step 3: Wrap with polythene and hold in place with waterproof adhesive tape. The polythene should be wide enough to completely cover the area and prevent the moss drying out. Step 4: Leave the patch in place until the end of the growing season i.e. at least three to four months to allow the damaged to heal. Step 5: Check the ties periodically to ensure there is no serious constriction to the trunk and loosened if necessary. 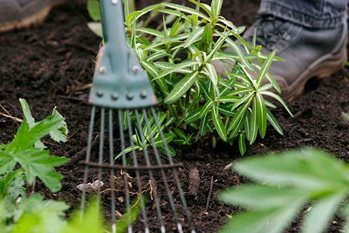 Step 6: Ensure adequate soil moisture by watering during hot, dry periods in spring and summer. Initially the moss and polythene can be applied as for partially-girdled trees but if all or nearly all the bark is gone some form of grafting will be necessary. Grafting is normally carried out in spring when the cambium is particularly active and the bark is "lifting" easily. Bridge grafting – this involves bridging the damaged section with scion material (i.e. bark/wood taken from the same species or cultivar of tree, not the rootstock). For small trees this is done by using a side graft. For larger trees an inverted L rind graft is used. Inarching or Approach grafting – a vigorous rootstock is planted alongside the damaged tree and eventually takes over the function of the original roots. For full and illustrated descriptions of the above grafts, please refer to The Grafter’s Handbook by R J Garner (revised and updated edition 2013) ISBN: 9781845337544 and in particular Chapter VIII Grafting established trees, section “To repair and improve”. There are also resources available online. Prevent further damage to trees by installing tree guards and or by erecting suitable barriers depend on whether the damage was caused by horses, deer, rabbits or voles.